Chris really is a hoot sometimes, especially when he gets in his biting mood. I know I have written about this before but seeing it never gets old. This entry was posted in Uncategorized and tagged biting, cat, cute, funny on July 25, 2018 by Charles Huss. 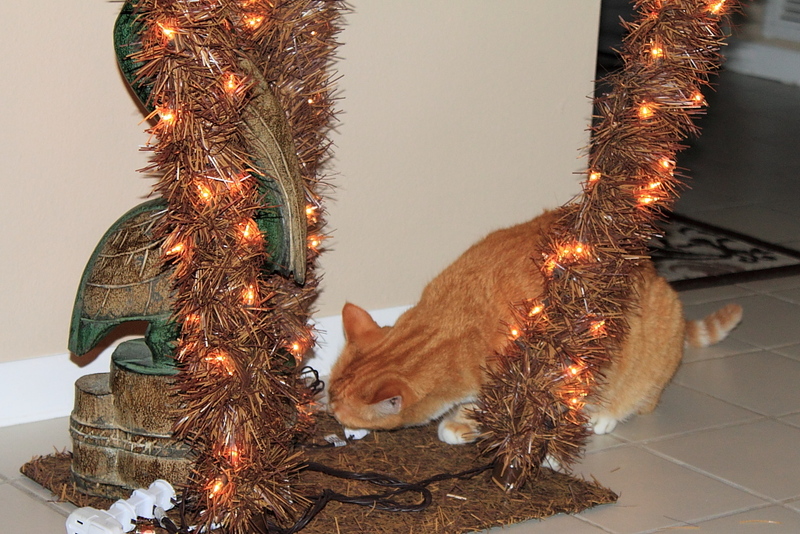 Last night Rose and I were watching television and Chris was chewing on the power cord for the Christmas tree lights. 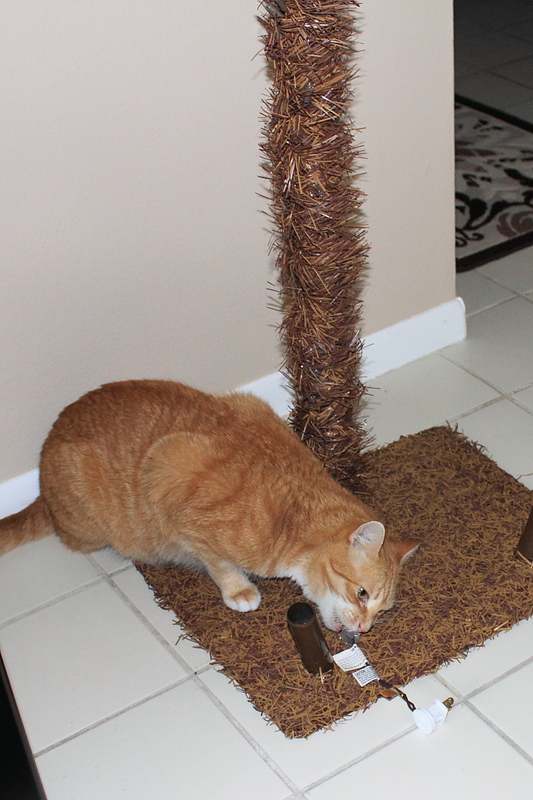 We yelled at him to stop so he then started chewing on one of the light bulbs… while it was plugged in. I had to pick him up and move him two or three times and each time he would give me a loud kitty yell and then go right back to what he was doing. It was like he was enjoying the negative attention. Now I worry about leaving the tree plugged in while we are in another room. I’m pretty sure he only does it for the attention that it brings him but I still have to treat him like a small child. 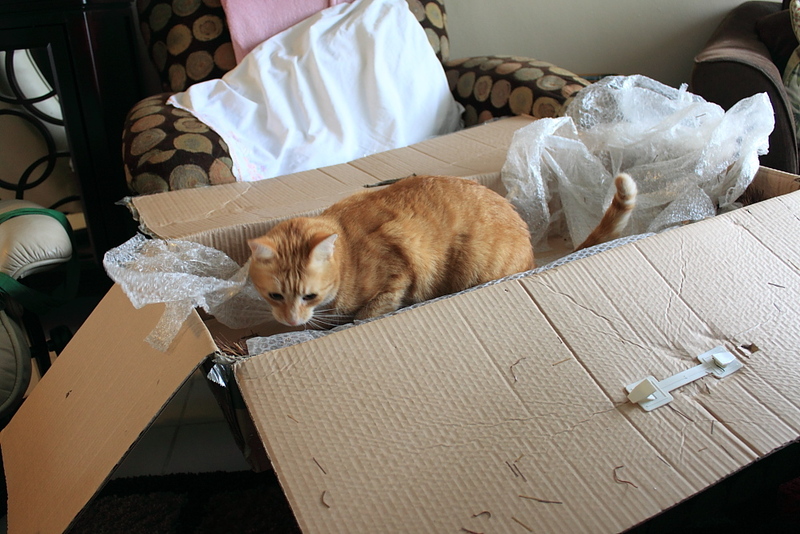 He is a four-and-a-half year old cat with the maturity level of a three year old child. At this rate, I’m going to mature before he does. 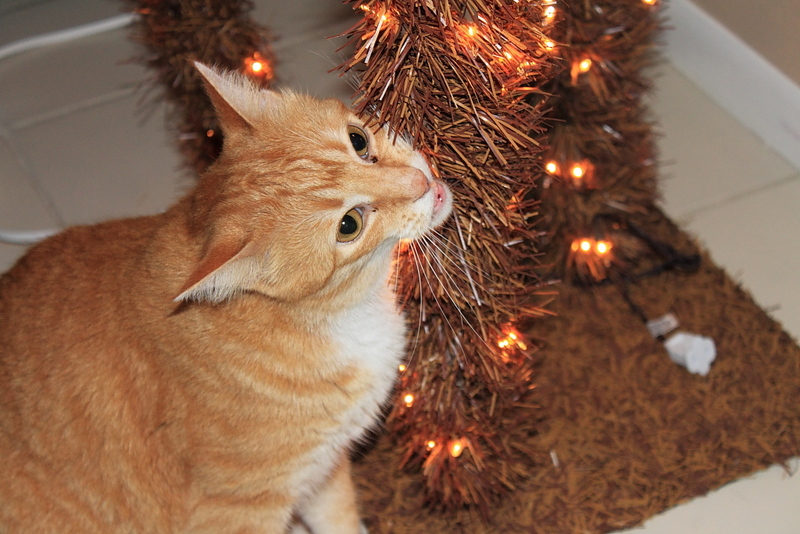 This entry was posted in Uncategorized and tagged Bad Cat, biting, chewing, Christmas Tree, danger, electrical cord, electrical shock, light bulb on December 7, 2013 by Charles Huss. We purchased a somewhat unconventional Christmas tree the other day. 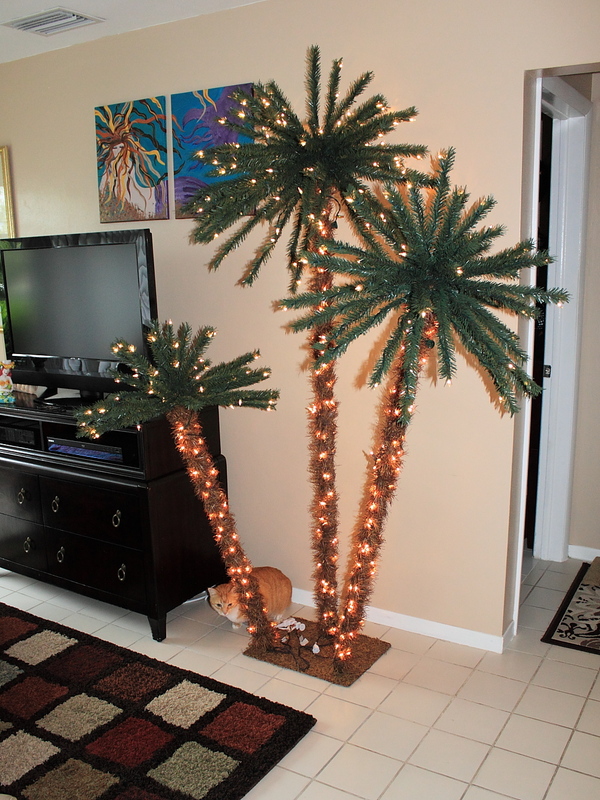 It is a trio of palm trees that seemed perfect for a Florida Christmas. Yes, I used the word Christmas instead of Holiday, so sue me. I just looked out the window and the sky is not falling and, as far as I can tell, the apocalypse has not begun so I may just use it again. 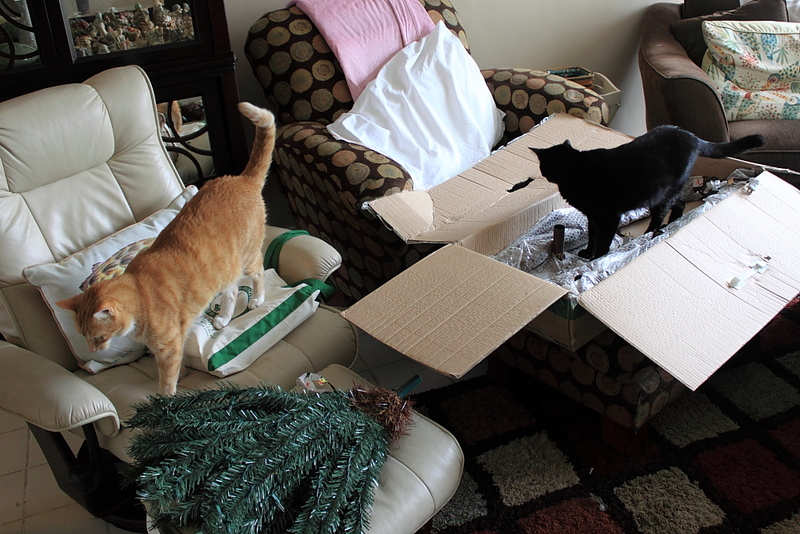 When we started to put up our Christmas… tree (whew, the world is still here) Chris and Puck took a strong interest in the box and the tree. Wow, something new to investigate. Cool. An electrical cord. I think I’ll bite it. This thing is stuck on here good. I claim this box for The Kingdom Of Chris. Chris! Did you see this? 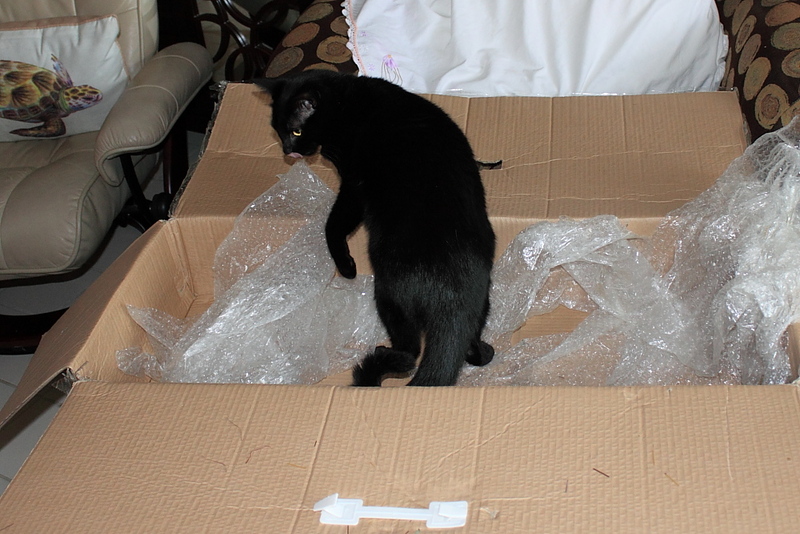 We’ve got bubble wrap. Ok, I’m ready to help decorate. I was a little worried about Chris chewing on the power cords but it seems the novelty has worn off. Now all that is left is the decorating. 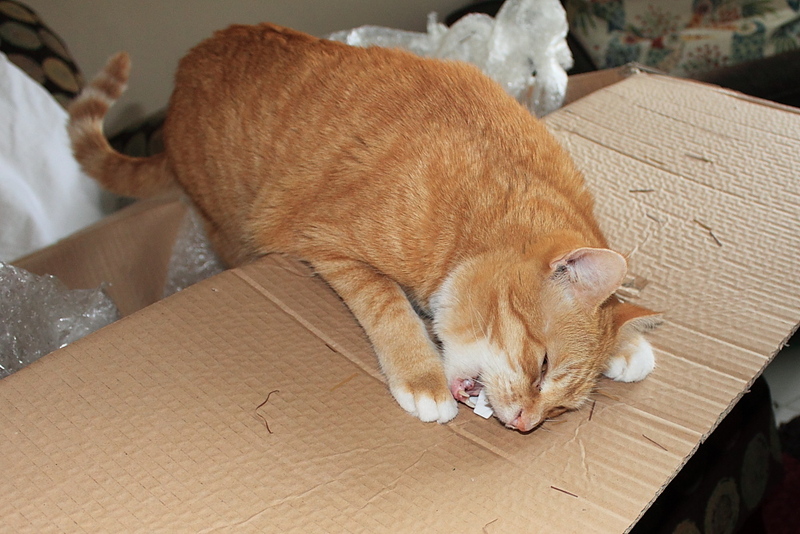 This entry was posted in Uncategorized and tagged biting, box, Cats, Christmas Tree, funny, playing on November 29, 2013 by Charles Huss. When Chris was a kitten, we had a big problem trying to sleep because when he wasn’t biting our ears or noses he was attacking our feet under the covers. I was hoping very much that this was the kitten in him and he would stop when he matured. He is now four years old and we are still waiting for him to mature. He did eventually stop biting our feet at night but he still is a nose biter. He especially like to bite my nose for some reason. These last few months I have noticed his biting has been getting worse, not better. He has taken to biting my arms and legs like he is a kitten again. He does not always act that way but he gets into these frisky moods where he feels like he has to bite me. I caught him in one of thee moods a few months ago and recorded it and then forgot it was on my camera until I noticed it the other day. Does anyone else have a cat that does this? I’m just curious how common this behavior is. This entry was posted in Uncategorized and tagged Bad Cat, biting, frisky, funny, Video on August 5, 2013 by Charles Huss.